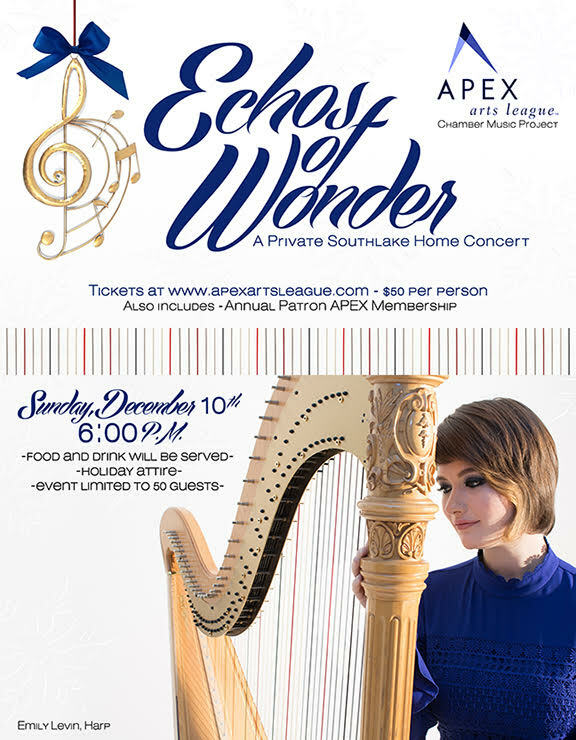 Apex Arts League is proud to present “Echos of Wonder”, featuring seasonally inspired music performed by award-winning Dallas Symphony principal harpist, Emily Levin, on Sunday December 10 at 6pm. As part of Apex’s Chamber Music Project, this program will be presented in the intimate setting of a Southlake patron’s home, decorated for the festive season. Food and drink will be served and holiday attire is requested. This special event is limited to 50 people so reserve your space now by purchasing tickets here Tickets are $50 per person and as part of this incredible offer, will include Annual Patron APEX Membership. With Apex Membership, you will receive discounts to all Apex programming, complimentary invitation to “A Taste of Apex” on January 25 at the Marq, and you will helping us cultivate a vibrant home of the arts in Northeast Tarrant County.